This annual Commemoration has been annually continuous since its inception in 1988. 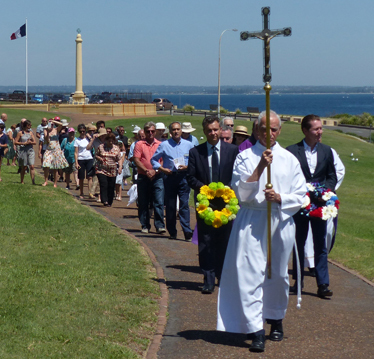 The Mass rite as celebrated at Botany Bay by the two priests of the Laperouse Expedition, the Conventual Franciscan friar, PERE LAURENT RECEVEUR aboard the Astrolabe and the ABBE JEAN ANDRE MONGEZ, canon of Ste. Genevieve aboard the Boussole. Under the royal Ordonnance concernant la marine of 1765 naval chaplains (AUMONIERS) were obliged to say Mass on ships on Sundays and feast days without exception unless prevented by bad weather and on other days as often as possible (Livre XV, MXXVIII, p.262). Mass was celebrated at an altar erected on the poop (“sur la dunette”) and the crew assembled below by a drum beat “battre la Messe”. The ordonnance details other particular protocols for the celebration of Mass. Laperouse makes no reference to Mass in his Journal during the voyage nor should he have as Mass was part of naval routine and its incidence would have been recorded in the ships’ logs which were lost with ships at Vanikoro within weeks of leaving Botany Bay. Nor would Mass have been said anywhere else during the voyage but aboard the two ships by their respective chaplains. Significantly Laperouse’s Journal does not recount attendance at Mass ashore by any of the expedition’s personnel in Catholic locations namely in the Spanish possessions, Concepion in Chile, Monterey in California, Manila in the Philippines nor in Portuguese Macao. The Laperouse Expedition entered Botany Bay on Saturday 26th January, the Feast of St. Polycarp followed by Sexagesima and departed on 10th March, Palm Sunday. There had to have been not a single “first Mass” but two, one on each vessel. Under the 1765 ordonnance it can be inferred that multiple Masses were said at Botany Bay by the two priests. The suggestion that the friar celebrated or “concelebrated the “first Mass” with the other priest is absurd. Concelebration of Mass by two or more priests is a 1960s innovation which did not exist in the 18th century on land or at sea. Any other suggestion that Mass was said ashore within the area of the French encampment, even the Requiem by the surviving priest following the friar’s death on 17th February ignores obvious questions of personnel deployment, security, logistics and the documented protocols for naval funerals which included the Office of the Dead.